These cookies have become one of our new favorites in the Peterson house! I must admit I am a sucker for peanut butter and chocolate mixed together and that is exactly what these cookies are. They are a delicious mix of peanut butter chocolaty goodness. I must admit that I love a cookies recipe where you can put all the ingredients in the kitchen aid and let it do the work for you. The recipe comes from Recipe Girl. 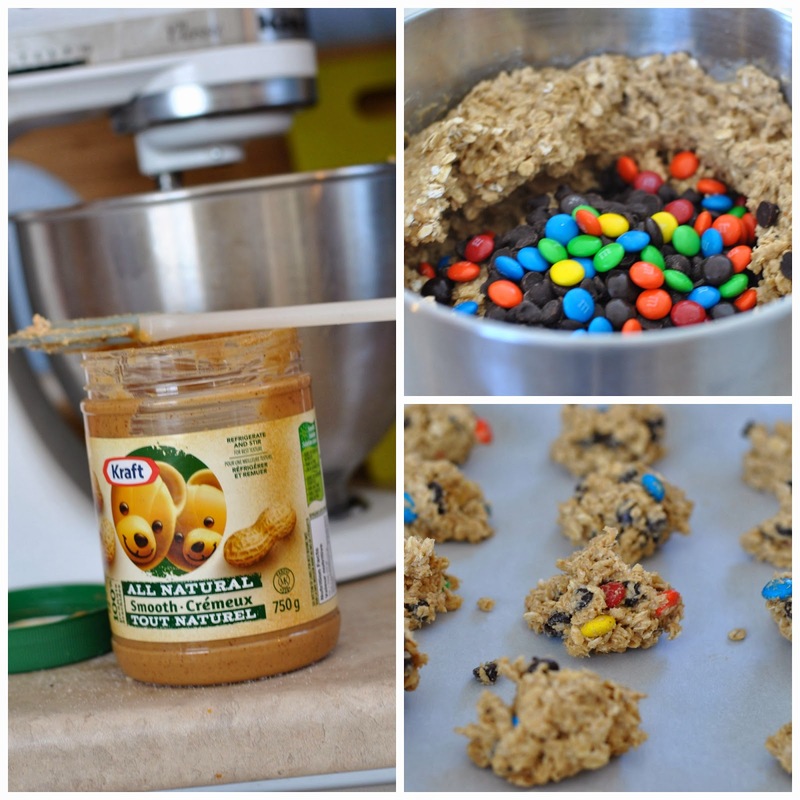 The only thing I have changed about the recipe is that we use natural peanut butter. 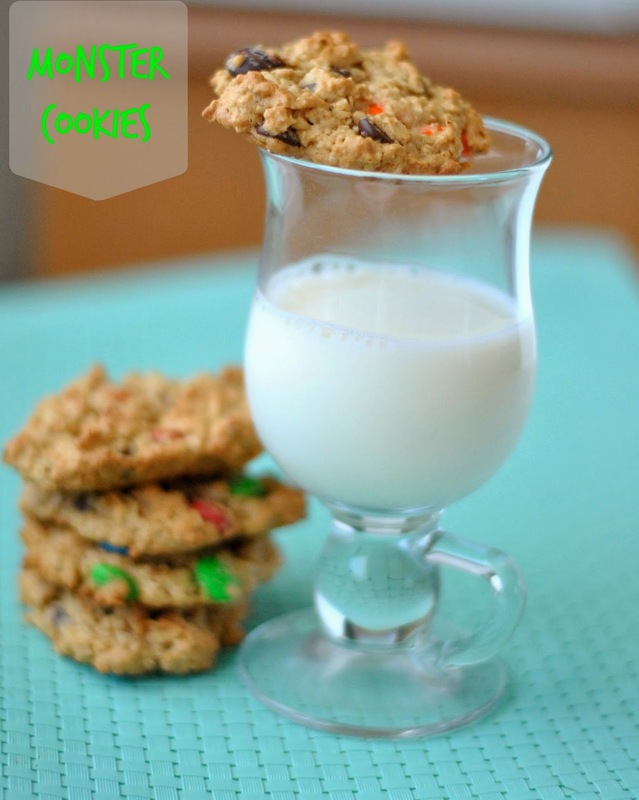 I have made this recipe a few times now and this was the first time I used M&M's in them. Other times I use chocolate chips and white chips. I have even done chocolate chips with peanut butter chips. 2. In a large bowl, combine the peanut butter with the sugars and butter, mix until well combined. Mix in the eggs and vanilla. Mix in the oats and baking soda. Then stir in the chips and M&M's. 3. 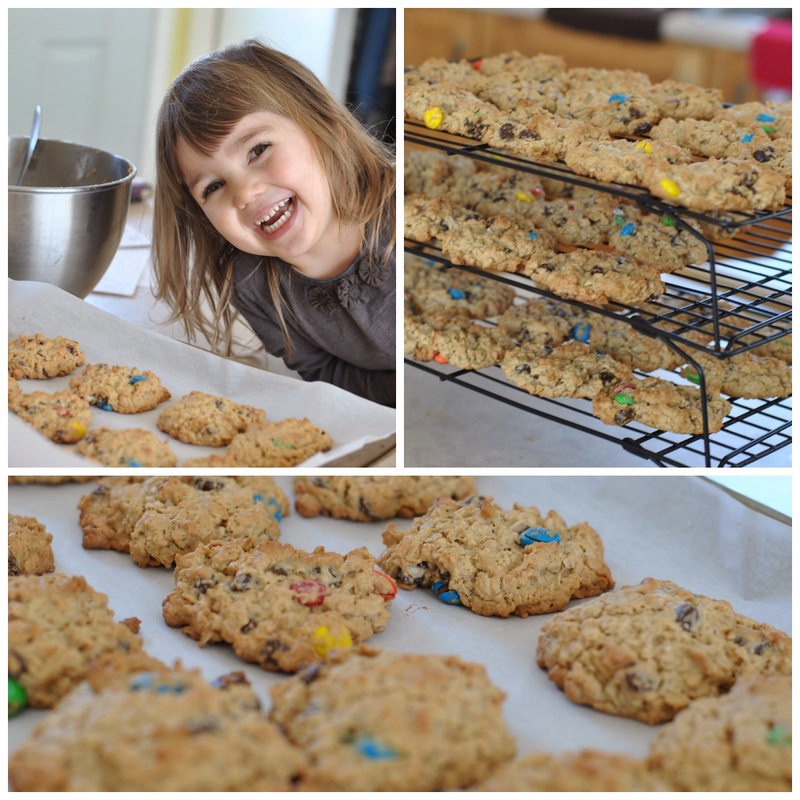 Drop the cookies by heaping spoonfuls onto the prepared cookie sheets. .
4. Bake 10 to 12 minutes. Do not overbake. Cool for 5 minutes on cookie sheets until cookies are set. Transfer to wire racks; cool completely before storing in an airtight container. These past 10 weeks (since the new baby came) have seem to have flown by and at the same time its been a really LONG winter. Even though the calendar says its Spring; we are still feeling cabin fever with crazy blizzards that just keep coming. Since I haven't been in the kitchen too much over these past couple of months due to adjusting to life with 4 little ones. Here are some things that we have been doing. 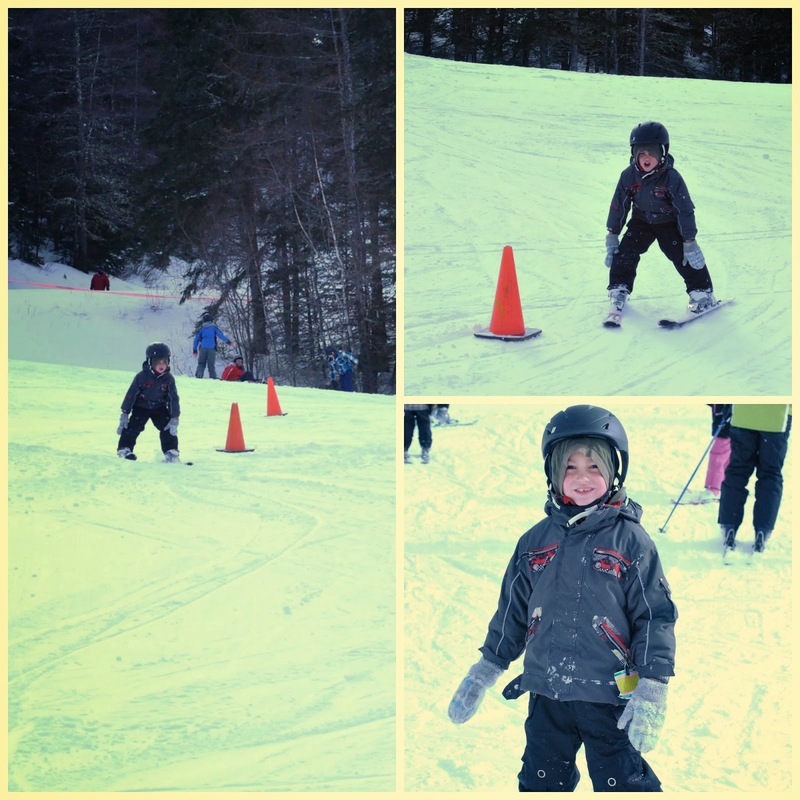 Eben had a chance to do ski school this winter and enjoying learning how to down hill ski. 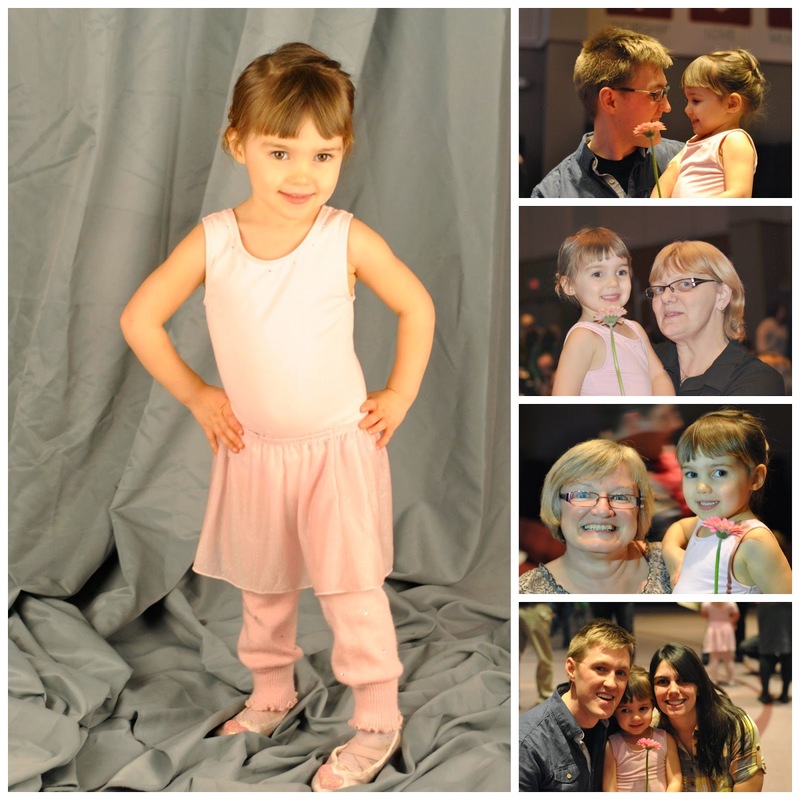 Jaelyn enjoyed taking dance class and being in her first dance recital. It is such a blessing to have a wonderful women teach her how to worship Jesus with dance. There were 20+ 3 and 4 year old in her class and they did a great job. It was special to see so many daddy's there with flowers for their daughters. J got a beautiful pink Gerber daisy. Every day is an adventure around here while we try at stay warm inside. 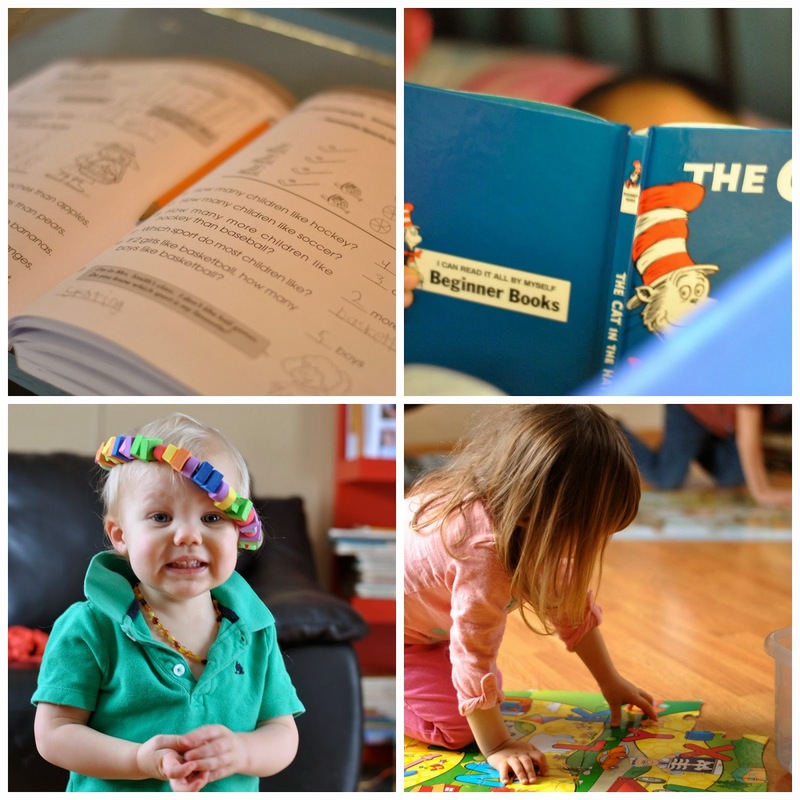 Our days are filled with school time, creative play and reading. 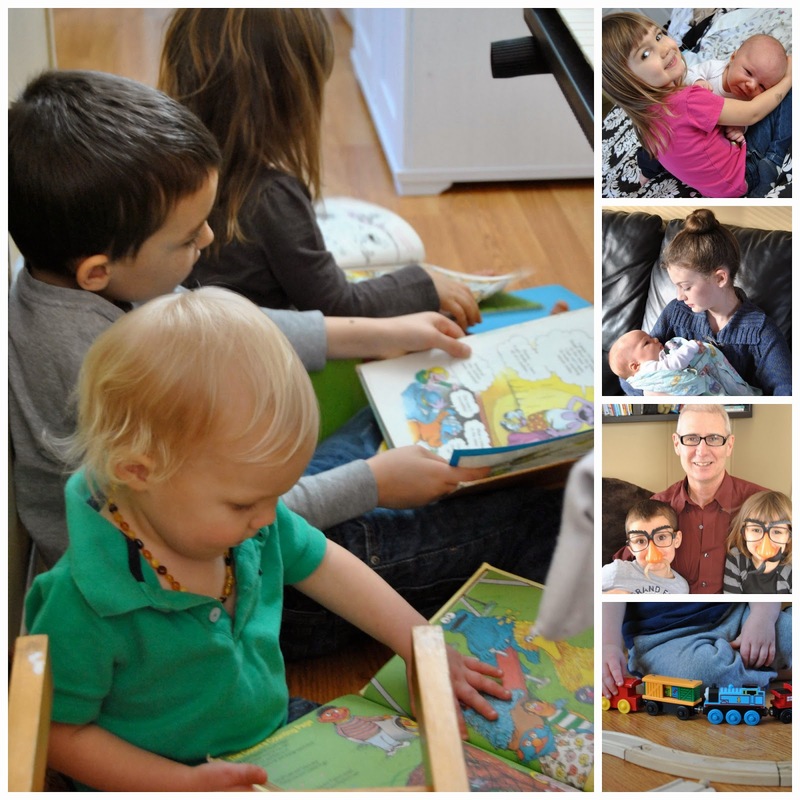 I really love how Eben enjoys reading aloud to his siblings. Jaelyn has become a great mommy helper with her little brother. She is such a loving servant who is always hugging and kisses Isaiah. Over March break we had some family visit for the first time to meet the baby which was fun for the kids. Grampy has made a few trip out to bring us pizza for lunch and to play Yahtzee with the kids. And to keep busy while Eben is in school Abraham has learned to build train tracks. We are hoping that the spring weather comes soon so we can get outside and play. How have you been dealing with this LONG winter. 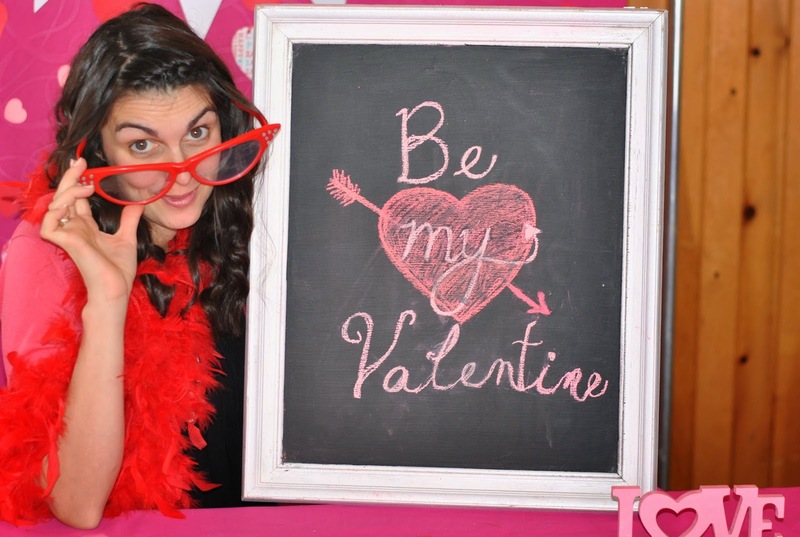 This year we started our LOVE festivities off with a home-school valentines social. The social committee who planned the event did a great job with games, crafts, snacks and this awesome photo booth they put together. 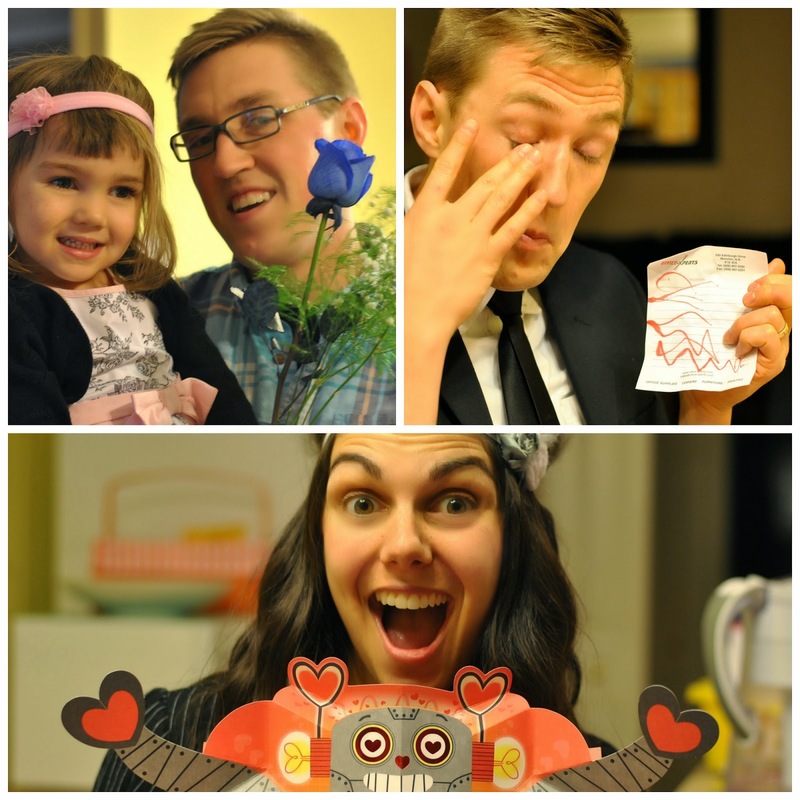 There were so many great props there I decided to make my husband a valentines card this way! 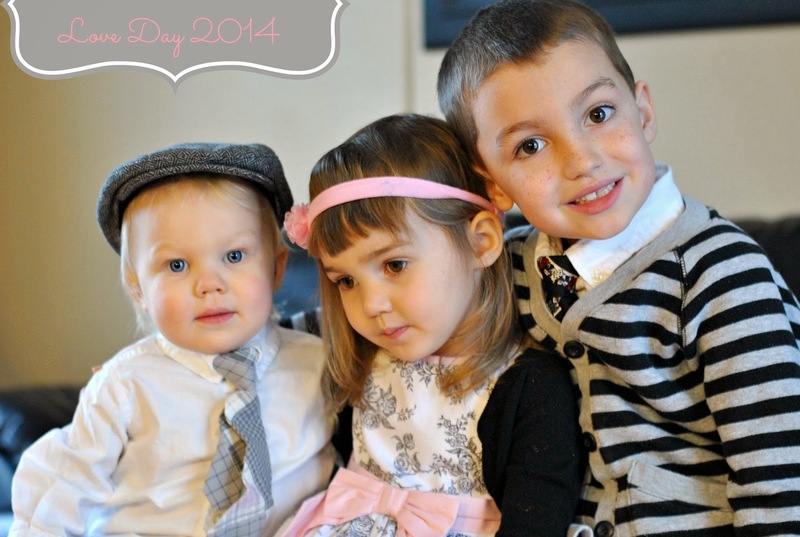 Every year for Love day we let the kids pick a restaurant theme and a meal they want to enjoy. The past two years Eben got to pick the restaurant and it has been some video game theme. This year since Jaelyn is older now she got to pick the theme. I loved having a girl theme with her! First off to go to a fancy restaurant you have to be dressed up. So the kids got into their finest clothes. Then we made some decorations for our restaurant. 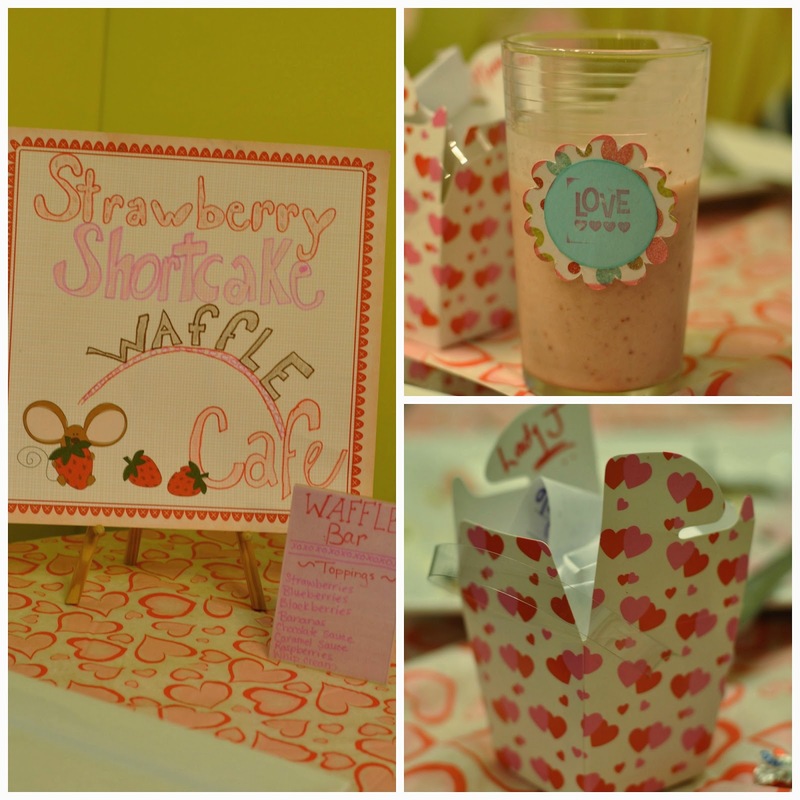 For our waffle bar we made a double batch of waffles and had all kinds of toppings for them. 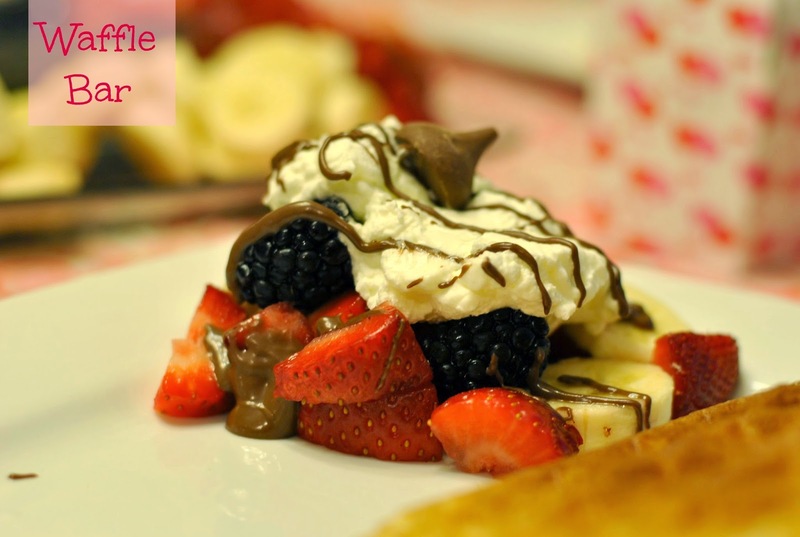 Strawberries, blueberries, blackberries (see the theme), bananas, whip cream, chocolate sauce and of course chocolate kisses. The kids got to dress up their waffles however they wanted. When daddy got home from work he had two roses. A beautiful blue rose for Lady J and a pretty white and pink rose for mama. Along with our roses he had two funny cards for us gals. Eben was lucky that night and got a free stay up late card to hang out with us when the little ones went to bed. 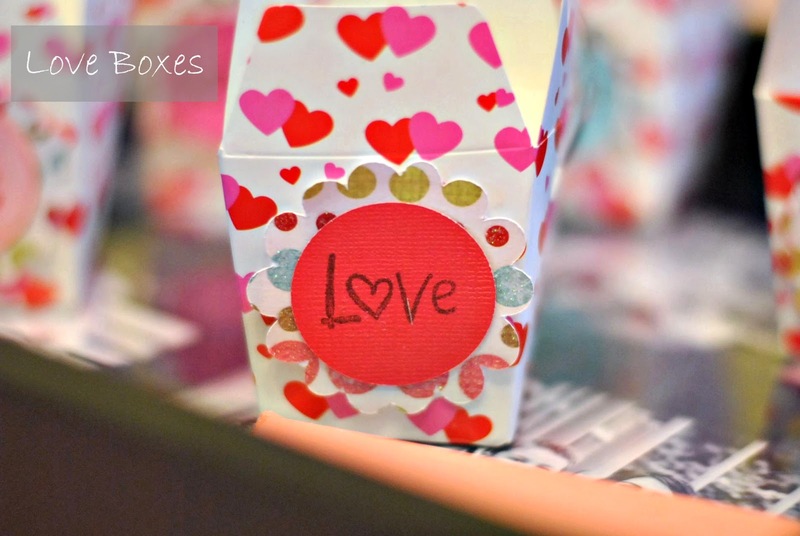 We also had valentines for each other in our LOVE boxes. Jaelyn's valentine to daddy brought tears to his eyes!! hehehe.